Submitted by Maryville Tim on Mon, 09/03/2007 - 11:00am. 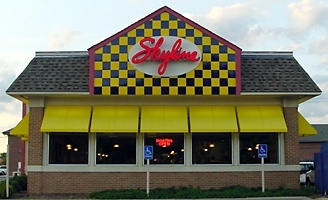 All 134 Skyline Chili restaurants found in OH, KY, IN, and FL. They serve "Cincinnati" style chili. Special thanks to kwtuttle for adding location names to the file. 9/5/08 Minor coordinate change to Florence Mall, KY location. 7/6/09 swtstr notified me of the Wilmington, OH store closure. 2/13/10 9 additions, 9 closings.